I am coming to have a new appreciation of bugs. I know that there are more technical terms, but in my mind “bugs” is good enough. Over the last month I have helped catch, make homes for, or release back into the wild bugs of all kinds: including roly polies, dragonflies, ants, beetles, praying mantises, grasshoppers and many more. This would not be my first choice of activity. The idea that they could potentially crawl where I didn’t want them to crawl, fly in my face, or bite me is not comforting. I’ve been teaching preschool for a month now and these boys love bugs. Every chance they get outside (or inside in the case of the dragonfly who thought our classroom would be a nice home), they point at, poke, and stare at the bugs. They also catch them and put them in my face. They aren’t trying to scare me. It just doesn’t occur to them that most people don’t like to have a praying mantis held just centimeters from their eyeballs. 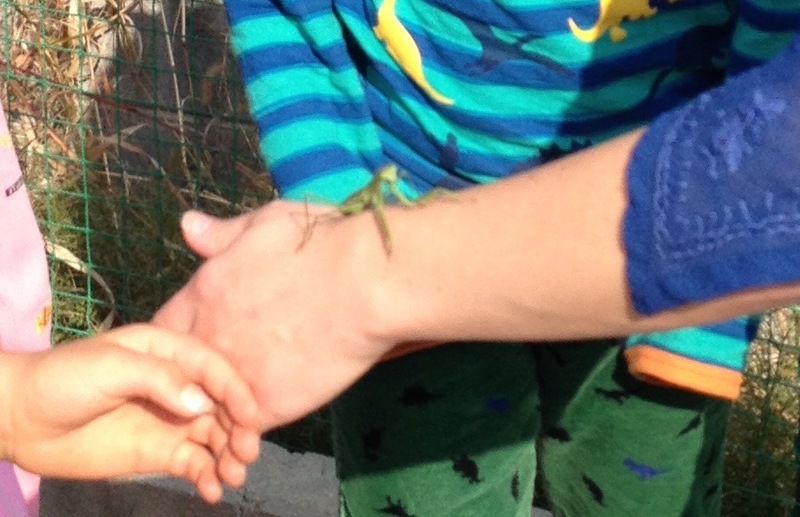 This was taken last year, but I am letting a praying mantis crawl on my arm. I may not love the bugs, but I do love the excitement and exuberance of my students. They are learning daily. It may not be conscious, but they are marveling at God’s creation. They are increasing their vocabulary and growing to love learning. Also, they have huge smiles on their faces. This makes the thought of a bug flying in my face or running down my clothing worth the risk. Who knows what bug adventures (or other adventures) next week will bring.